Flies, Mountains, Birthdays and LPG. This page comes to you from the fly-infested car park of the Reserva Natural Lomas de Lachey . Although it is 29°C inside Mog, all the widows are closed to reduce the fly ingress rate to below 100 per hour. The only ventilation comes from the roof-light which is fitted with two fly screens. There are 86 flies trapped between the two screens. I have sprayed them with a Russian fly spray that promises instant death to all living creatures (except it seems Peruvian flies). When you swat these flies they appear to contain "blood". I seem to recall from "O" level biology that flies do not have blood, so presumably this red liquid, now so liberally squashed onto the walls of Mog, comes from elsewhere. There have been lots of attractive photographs on this web site, so I thought it was time to redress the balance. 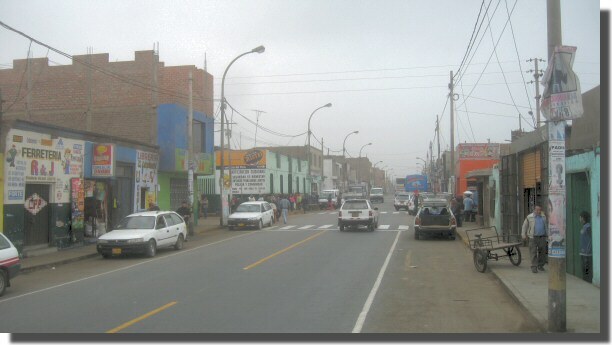 The photograph above is of a typical no-name small town on the PanAmerican highway between Barranca and Lima. The photograph is dull, dirty and hazy because that's exactly what the town is like. The green establishment on the right is the "Riviera" cafe. The bread shop on the left claims to have been open 05:00 to 22:00 every day for 50 years. Although this is a 55kph zone, the trucks and busses do not slow down, they just sound their horns more often. The white lines on the road, that would in other countries indicate a pedestrian crossing, have no significance here. The peeling posters on the pole on the right extol the virtues of one of the many candidates in Peru's upcoming 2006 election. Indeed vast tracts of housing, most utility poles, many road signs and quite a lot of innocent rocks have been painted gaudy colours in praise of dentally enhanced politicians. I am inclined to favor "Waldo", not on any ideological grounds, but simply because his (her?) signs seem the least offensive. For every "stunning" view there are often many kilometers of drab urban sprawl. To restore the balance, above is one of the many "stunning" views on the road between Huaraz and Conococha. The mountain is the 4720 metre Abra Yanshalla and is 37km away. There were no flies or people. How do you find somewhere to park for the night? This rarely asked question should be asked more often. Finding somewhere to park for the night is a constant challenge for the "day leader". The two extremes are the easy "in the middle of nowhere" wild camp and the "not to be missed" proper camp site that all overlanders use. Alas, Barranca was far from wild and could easily be missed. You can of course just drive into a town and hope to see a hotel with a large secure parking lot. Or you can do your research first. The two sources of information usually consulted are the guide books and the web sites (or private logs) of fellow overlanders (these may have GPS coordinates if you are really lucky). Barranca does not rate an entry in Lonely Planet or Fodor's. The 2000 page South American Handbook manages "At Barranca the beach is long and not too dirty, though windy. There are various hotels." However, before the start of PanAm 2006, we had scoured dozens of web sites and extracted the locations where other overlanders had parked for the night. Those with GPS coordinates were added to the database of the Fugawi navigation software running on the computer in the cab of Mog. This yielded one relevant entry: Hotel Chavin - Safe parking lot of the best hotel in town; large pool; friendly staff; good restaurant. So with visions of an attractive sea-front hotel in our minds, we followed the GPS's directions to a grey six storey concrete hotel, well inland, on the dirty main street of a deeply unattractive town. We drove straight past the Hotel Chavin until the main street of Barranca petered out at a litter strewn roundabout. The road to the right looked less depressing than the other two alternatives, and we thought it might lead us to Puerto Supa. The map also showed a lighthouse (presumably on the coast) in that direction and we saw a "lighthouse like" building in the distance. It turned out that "right" was not the road to Puerto Supa (thank God, we saw Puerto Supa later), nor was the building we could see the lighthouse. The road did however meander down to a grey beach with a row of closed cafes and bars. At one end of the beach we found an open cafe with a car park. We asked if we could stay there for the night, they said "yes", we asked if they served beer, they said "yes", we asked if they served food and they said "yes". 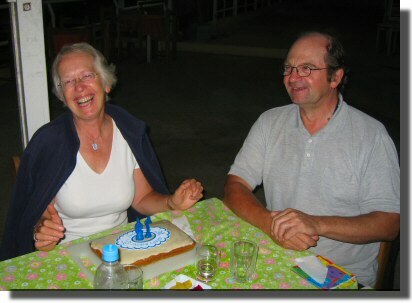 So we celebrated Ann's 59th birthday at the Malabu restaurant on the "not too dirty beach" at Barranca (S 10.767677 W 77.762063). Their squid was good, their fish was good, alas, their red wine was not. Judy's carrot birthday-cake (made from scratch, of course) was excellent. The restaurant even managed to provide candles for the cake, but only in the form of a "7" and a "9". Sorry Ann. Mel is full of gas! The adaptor to allow Mel's LPG tank to be filled with Peruvian GLP works! 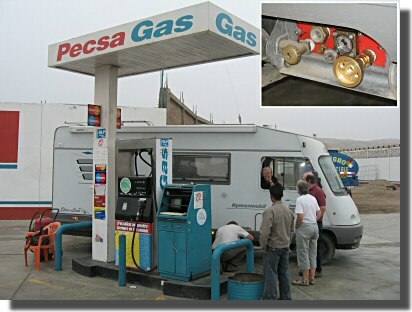 The deed was accomplished at a Pecsa fuel station on the PanAmerican highway 149km North of Lima at S 11.111073 W 77.595143. This page contains the latitude and longitude (from GPS using WGS84 Datum) of places of interest.